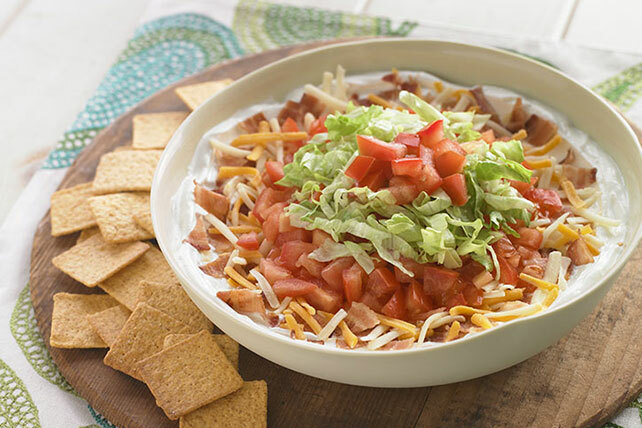 Find all the ingredients of what's arguably the best sandwich on earth, presented as a layered BLT Dip with the luscious add-ons of sour cream and cheddar. Mix sour cream and onion powder until blended; spread onto bottom of pie plate. Heat bacon as directed on package; cut into small pieces. Sprinkle over sour cream mixture. Top with cheese, 3/4 cup tomatoes and lettuce; sprinkle with remaining tomatoes. Serve this dip with assorted cut-up fresh vegetables or thin wheat snack crackers. Substitute 1/4 cup OSCAR MAYER Real Bacon Bits or OSCAR MAYER Real Bacon Recipe Pieces for the warmed chopped fully cooked bacon. Separate bacon slices, then stack on top of each other. Cut into desired size pieces using clean kitchen shears.